Using Microsoft Office on a tablet is probably high on your wish list if you work in more than one location. And while Microsoft promises to help on that front once Windows 8 tablets are in the wild, upstart CloudOn jumped the gun in January by providing a virtualized Word, Excel, and PowerPoint for the iPad. It became the top free app in the AppStore literally overnight. Now that app is expanding globally and broadening its features to do more than Office does alone. Although CloudOn first focused purely on providing access to Microsoft's productivity suite, its next goal is to build on top of Office. “We're trying to look at Office as a platform; with one billion users it's even bigger than Facebook," CEO Milind Gadekar told PCWorld. Today's CloudOn 2.5 release adds annotation and tracking capabilities to its iOS app (with Android support coming later). Using CloudOn's annotations on an iPad, it was a snap to draw an ellipse or rectangle in a Word doc with my finger, then type out a text note. Markups are preserved within the file--saved to your Dropbox, Box, and Google Drive accounts--no matter what platform you use later to run Office. This doesn't revolutionize the Office experience, but it should get more interesting when video and voice are supported. 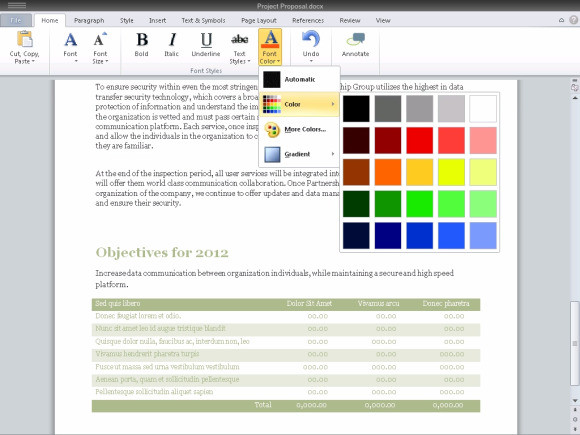 CloudOn lets you mark up Office docs on a tablet. 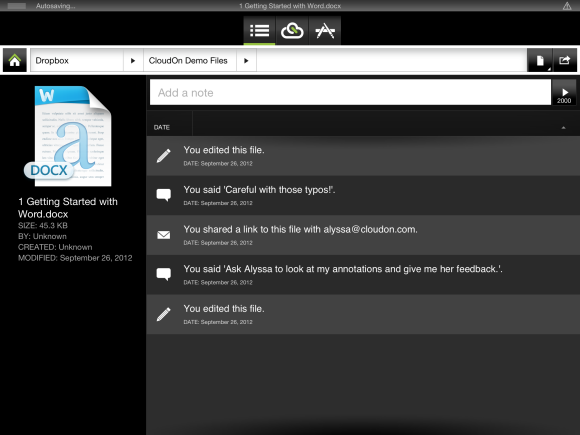 To help collaboration, the new CloudOn FileSpace feature provides a real-time stream of data about changes to documents. This offers context about your workflow on a project, information that might otherwise get lost within a stream of emails. "It's no longer an individual productivity world, it's a group productivity world," Gadekar said, adding that many corporate emails are among some 2 million users who have signed up. The majority of people are probably bringing CloudOn to their devices rather than having the app introduced by their workplace. In addition, as a "building block" toward working on ever-smaller devices, CloudOn 2.5 is optimizing Microsoft's ribbon toolbar for touch gestures. Roomier icons make it easier to edit fonts, check spelling, and track changes. FileSpaces will show you who's done what, and when, with that document. 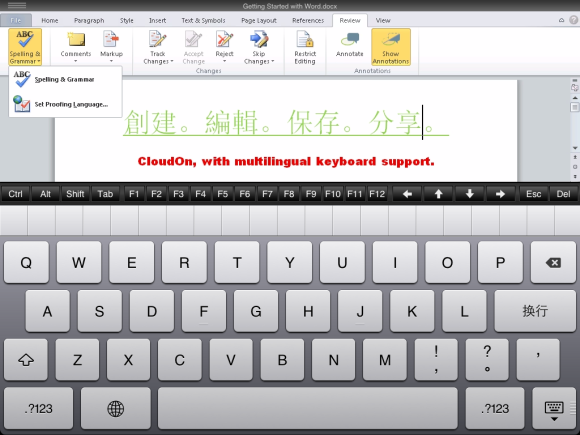 With users in 80 countries, CloudOn now supports all the languages and keyboards that Office does. It does all this with through official partnerships with Microsoft and Adobe. It's worth noting that CloudOn is running a virtualized version of Office 2010. It's considering the upcoming 2013 suite but doesn't have immediate plans for that yet. Microsoft, meanwhile, will ship its much-anticipated Surface RT tablet inititally with Office Home and Student 2013 RT Preview. When the final code appears there is unknown, and Redmond continues to deny rumors that it will soon offer Office for Android and the iPad. CloudOn 2.5 is available here for the iPad and here for Android Honeycomb and Ice Cream Sandwich tablets 3.1 and higher. CloudOn now supports all the languages Office does.